Of course, spring also means Getting the Garden Ready Time. Woot. We are all so excited to soon have veggies that don't taste plastic! Hubby tilled and I've gone through my seeds and restocked. Now I just need the energy (and the rain to stop, grr) to get out and start hilling and planting. I always get so much writing accomplished while digging up the earth. Of course, it doesn't always make it from my head to the computer, but I try. Fall is my favorite season, but I love spring, too. 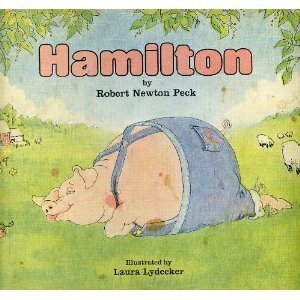 My favorite childhood book (which I still have, and my kids know by heart now, too) is all about spring. "Not to be ornery, not to be rude. 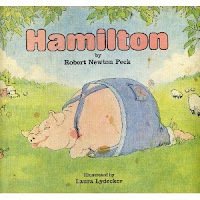 Hamilton was only dreaming of food." I love an unlikely hero. Go Hamilton! 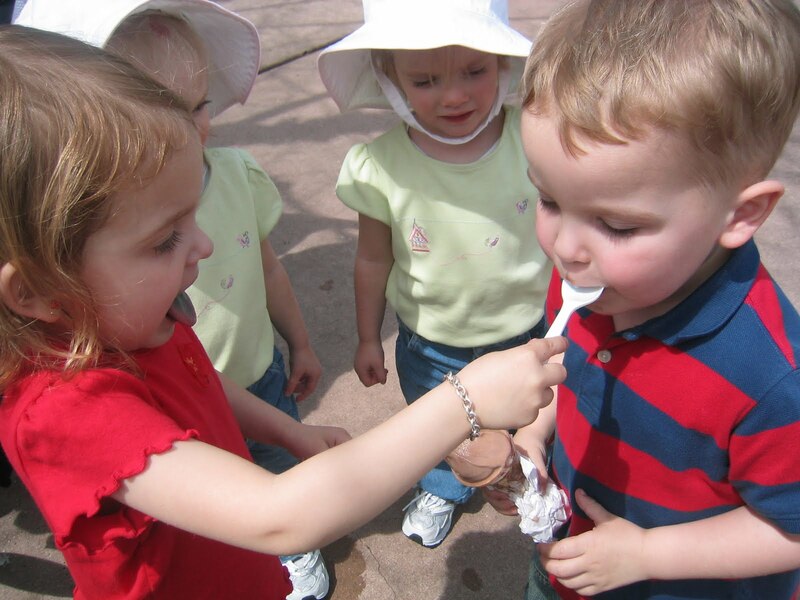 Speaking of food, ice cream is sooo good in the spring. Especially when you share it. 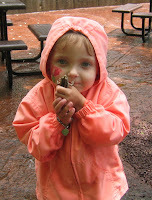 April showers, as we all know, bring May flowers. But they also bring out the frogs at the zoo. This one did not turn into a prince, even though she gave it plenty of kisses! 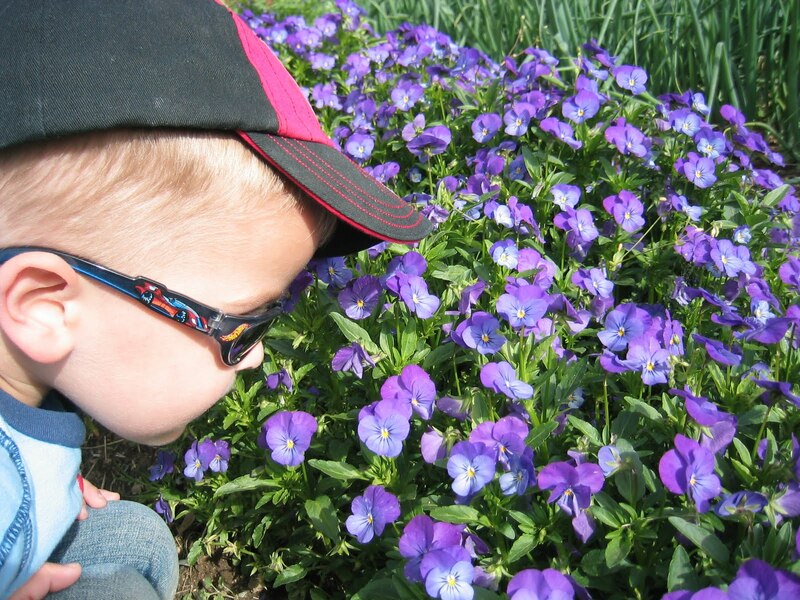 Always remember to stop and smell the...flowers. Even if you are an uber cool 3 year old boy. 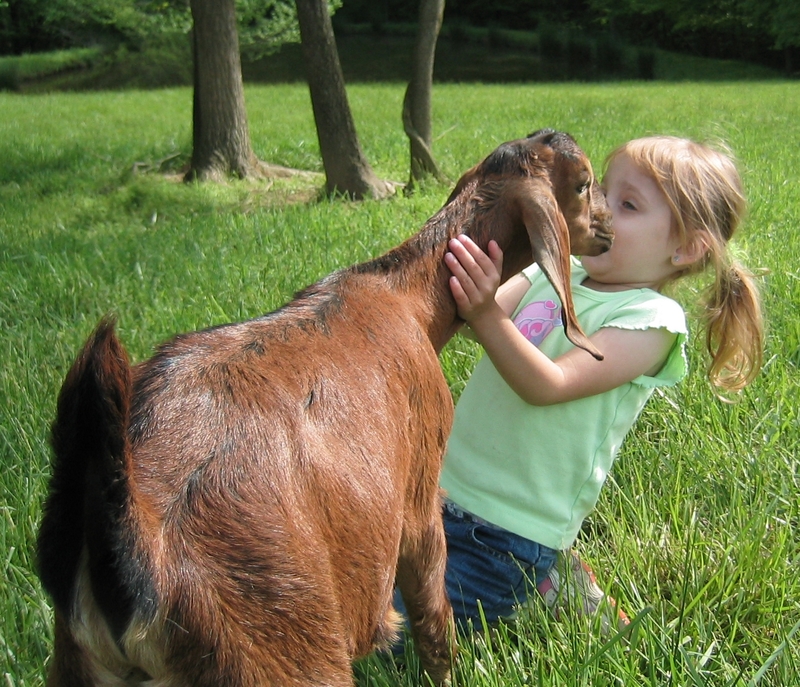 We visit the Goat Lady Dairy every year to see their new arrivals and buy lots of goat cheese. Yum. Don't worry she was having the time of her life. My little animal lover. There's not much better than making messes. And it doesn't get much messier than coloring Easter eggs! Not to be outdone (*cheers, hoots and hollers*) there is another new spring "baby" this year. (*squeals giggles and sighs*) Incubus finished their brand new, long-frickin'-awaited album, If Not Now, When?, last week. And they released a sneak peek at the new single (just for me; I'm sure of it). Ahhhh. Hoppy Spring. Yeah, I know. Couldn't resist. Know what you mean by plastic fruit and veggies! Wish we could have a garden. 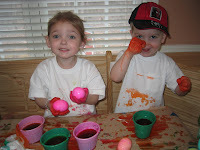 Bet there was more color on your kids than the eggs! I'm surprised it's raining there! They've called for rain on us four days in a row, but nothing. Humid, but bright blue sky. Awwwww yay for Baby A and Baby B!! They're adorable!! Spring is such a great time - great for your garden too!! Gorgeous kids. would love a garden to grow veggies - some day! I love when kids aren't afraid of frogs! Great pictures. Yeah! Spring! I love it too. 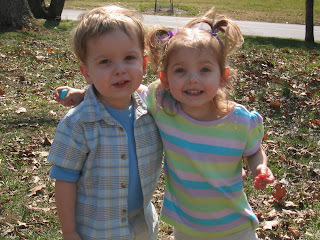 Your photo of lovely eggy twins made me think about dyeing eggs when I was young. I even used that in the into to An Easter Walk. Awww, so cute. I miss that age, too. I have to get cracking' on my yard/gardens. It's still a bit cold for planting veggies and annuals, but I need to clean the beds out and do some pruning. I haven't had time, but I do need to get that done. I'm super excited about their new album! Super pictures of the children, they are so adorable. Your post was really refreshing to look and read. Yhanks for the visit and comment. Ha, ha. Hoppy spring to you too! Great pics. Hope things slow down for you a bit so you can get your projects done. I'm excited about our veggies, too...major garden work (and broken nails and sun burn) planned for the next couple days. So excited to hear you're working on that new story. YAY for new Incubus! I'm so excited about it! My 9 year old asked me if we were going to dye eggs and have an Easter egg hunt like we always do. I joked and said, "Aren't you a little old for us to be hiding eggs for you?" She could not believe I could utter such blasphemy. LOL!! I'm so glad spring is here. Flowers, ice cream, I took my kids out for custard on Monday. It was wonderful. Thanks for sharing a bit of life and your pictures! I'm starting up a 'Critiquing Crusaders' program, where participants in the Second Crusade can find other writers to exchange critiques with or form critiquing circles. If you're interested, come by The Kelworth Files to check it out! All content copyrighted to blog owner.